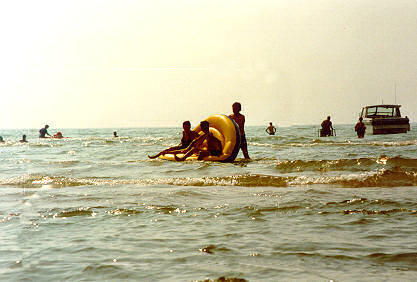 One of the wonderful things about our Lake Ontario cottage rentals is that they are close to some beautiful beaches. Basking on the beaches of Lake Ontario is like being at the ocean without the salt. 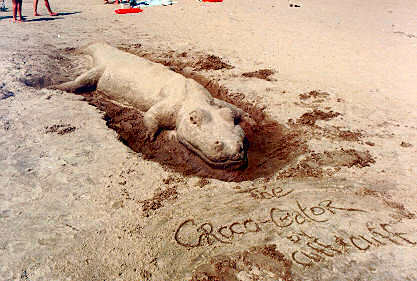 The sand is fine (like Bermuda sand, just not pink) and perfect for making sand castles or sculptures. No giant seaweed, no water critters and no salt. The perfect spot for enjoying a day in the sun. 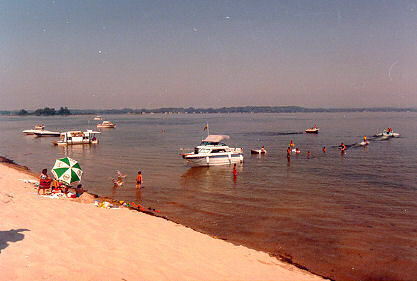 Sandy Pond Beach a.k.a. 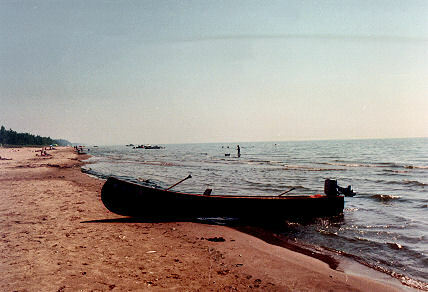 Boaters Beach is across the pond from our Lake Ontario cottage rentals and only accessible by boat. It is a stretch of land with a huge sand dune that lies between Sandy Pond and Lake Ontario . There are no facilities and no life guard. The beach is relatively private with a portion of it owned by the Nature Conservancy. To protect the dunes the Nature Conservancy erected a board walk that can be used to walk over the dunes from the pond side to the lake side. They have also planted protective grasses to prevent erosion of the sand dunes. In addition, a portion of the land has been set-aside as a bird sanctuary. The water on the Sandy Pond side gets deep quickly and many people use it as a starting point for water skiing. The lake bottom on the Lake Ontario side gently slopes making for gradual water depth, which is great for swimming. Sandy Pond Beach is one of the true gems of the world. Westcott Beach State Park on Lake Ontario, with rolling, wooded hills and open, grassy meadows sheltered by Henderson Bay. The park has a children's playground, picnic areas and hiking trails food, picnic tables, pavilions and showers. This beach is 12 miles north of the cottages. Lake Ontario and Sandy Pond, hunting New York Deer, ducks, geese and wild turkey and to photograph diverse scenery of NY’s Salmon River, Sandy Pond and Lake Ontario. We New York!